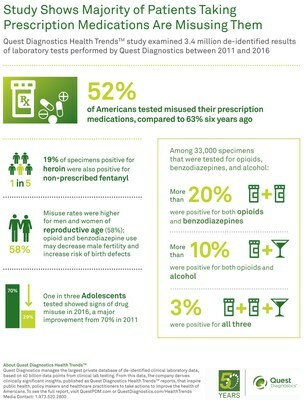 MADISON, N.J., Sept. 6, 2017 /PRNewswire/ -- A majority of test results of patients taking prescription medications show signs of drug misuse, including potentially dangerous drug combinations, finds a new large-scale analysis of laboratory test results from Quest Diagnostics (NYSE: DGX), the world's leading provider of diagnostic information services. The report, titled "Prescription Drug Misuse in America: Diagnostic Insights in the Growing Drug Epidemic," was released today at the medical conference PAINWeek 2017, being held September 5-9 in Las Vegas. The examination of 3.4 million prescription medication monitoring lab tests performed by Quest Diagnostics between 2011 and 2016 paints a stark picture of the continuing epidemic of prescription drug misuse, and the dangerous, potentially deadly patterns of that misuse. Opioids and benzodiazepines depress the central nervous system. When combined, respiratory suppression, cardiac distress and even death by overdose can occur. While physicians may prescribe the two drugs together for some patients, the practice is generally regarded as risky; in August 2016 the United States Food and Drug Administration (FDA) issued a "boxed warning" on prescription opioids and benzodiazepines alerting prescribers to the dangers of concurrent use. According to the Centers for Disease Control and Prevention (CDC), more than 30 percent of opioid-related deaths also involved benzodiazepines. Quest Diagnostics manages the largest database of de-identified clinical laboratory data, based on 40 billion data points from clinical lab testing. From this data, the company derives clinically significant insights that enable public health, policy makers and healthcare practitioners take actions to improve the health care of Americans. Quest Diagnostics Health Trends studies are published in peer-reviewed medical journals and by the company as a public service. Quest Diagnostics Health Trends reports have yielded novel insights to aid the patient and population management of allergies and asthma, chronic kidney disease, diabetes, heart disease, influenza, prescription drug misuse and employer wellness.